You've no doubt heard news reports about debit card skimmers being found at certain retail or banking establishments. Card skimmers can be installed at ATMs, restaurants, gas payment terminals, and even store check-out lines. The phony equipment is small and can be hard to spot. Some card skimmers even include a phony keypad that fits over the real one to steal your PIN. Your debit card account number can be stolen if you swipe your card in a skimmer. Unlike credit card transactions, debit cards may not offer much protection against fraudulent purchases. Your checking account could be emptied, and you might not be able to reverse the charges. Your best defense against debit card skimmers is vigilance and awareness. Here are a few ways to protect yourself. When using a card terminal, look it over before you swipe. It can be difficult to spot a well-hidden skimmer, but some clues can help. If the terminal you are about to use does not match the other ones at the location, you might be looking at a skimmer. Number pads that look mismatched or are an odd size are a red flag. Press on the card receiver and wiggle the keypad; skimmers are designed to be retrieved quickly by thieves and may have loose parts. A keypad that is sitting on top of the machine rather than flush with the surface of it can also be a sign of a skimmer. If you're at a gas station, look at the card scanner at the pump you're about to use; ensure that the security tape is still intact over the panel before you insert your card. If you have the option to insert your card into the payment terminal rather than swipe, do that. Chip cards, otherwise known as EMV cards, are much more secure since they do not pass your actual account numbers to the retailer. Even if someone steals the numbers from an EMV transaction, it is not useful to thieves since a unique number is generated for each transaction. At restaurants, the normal payment procedure is to give your debit or credit card to the waitstaff who takes it away to swipe it. If you hand your debit card to someone else to process, they can run your card through a second card reader and steal your information. Or, someone could simply write down your account number and the security code from your card and use it for fraudulent transactions. The best security practice is to never let your debit card out of your sight and pay for your restaurant meals with cash. You can monitor your bank statements regularly to spot suspicious activity early in case a criminal does get your account information by skimming your debit card. If you do find fraudulent transactions, work with your bank to close your account right away and minimize your losses. Your bank may offer automatic account alerts to make monitoring your account easier. I prefer to withdraw cash at the bank a couple of times a month instead of stopping by an ATM every time I need cash. I show my driver’s license at the bank to make a withdrawal — no debit card is required. Not only does getting cash at the bank eliminate the risk of debit card skimming, but you avoid any ATM fees as well. Another option is to pay with cash to avoid the risk of skimming altogether. I use an envelope budgeting system and pay for all food expenses with cash. 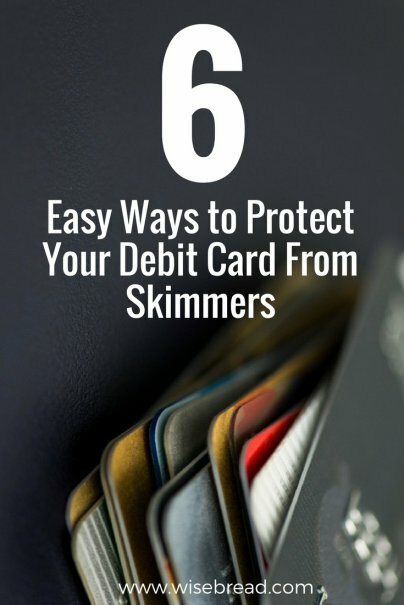 This greatly reduces the number of card transactions I make each month, and therefore reduces my risk of having account information stolen by a skimmer.